You know we like to share handwriting activities around here, right? 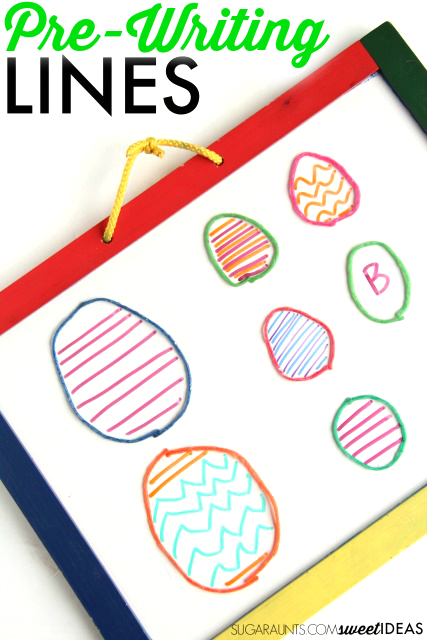 This Easter egg pre-writing activity is a fun way for young children to work on pre-writing skills in order to build a base for letter formation and pencil control. While we made this activity an Easter egg-ish shape, you could do this activity any time of year and use any shape to work on pencil control within a confined space. 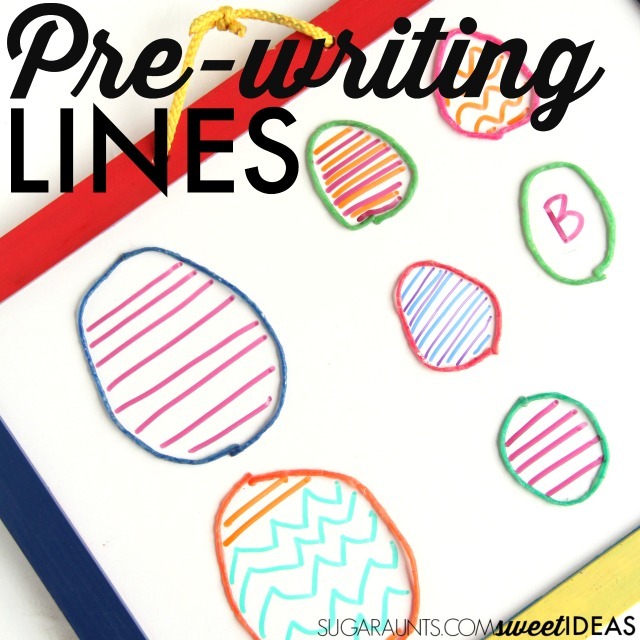 Preschoolers and Toddlers will love this early handwriting activity! All of these skills are needed before a child can form letters and work on line awareness in Kindergarten. If a child is showing difficulty with forming diagonals in letters like "A" or "M", this would be a fun way to work on building the skill for improved legibility in written work. Using THIS Dry Erase Board worked out great for this activity, because we did the same writing activity on the reverse side, which has a chalkboard. Writing with small pieces of chalk is a fantastic fine motor and intrinsic muscle strengthening activity to work on the fine motor skills needed for endurance in drawing and coloring, as well as the tripod grasp needed for an appropriate grasp on the pencil. A chalkboard surface for drawing lines is much more resistant than a smooth dry erase surface, providing more feedback during line formation. We used these Dry Erase Markers for their fine point and colorful selection, which made making these Easter eggs a creative activity, too. My preschooler loved picking out the colors to create patterns. The last item we needed for this handwriting precursor activity was Wikki Stix . As an Occupational Therapist, I feel like I'm always pushing the benefits of Wikki Stix. The bendable and mold-able sticks are a great fine motor and handwriting tool. 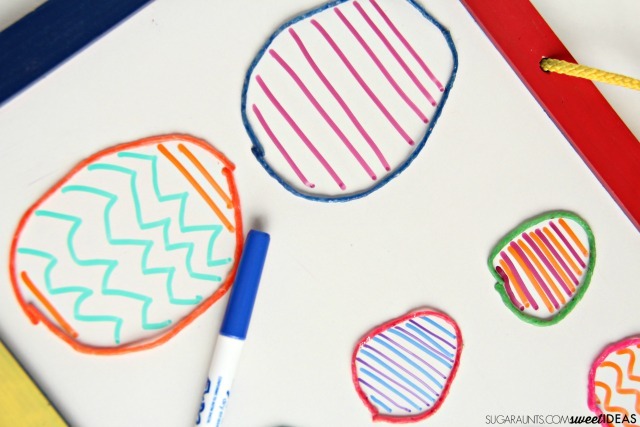 In this activity, I bent one or two wikki stix into an egg shape. You could also make circles, squares, or any shape for your handwriting task. Age 4- Copies an "X"
The developmental progression of these shapes allows for accuracy and success in letter formation. Get a FREE Developmental Progression of Pre-Writing Strokes printable HERE. For this activity, we used the Wikki Stix to right on the dry erase board. I created egg shaped ovals with the wikki stix. I then showed my preschooler how to draw lines across the eggs to create patterns and designs. We practiced horizontal lines (going from left to right) and vertical lines (going from top to bottom). We also added circles within the boundaries of the wikki stix and diagonal lines, too. The physical border provided by the wikki stix gave a nice area and cue for pencil control. Try doing this activity with progressing level of developmental line skill. You can also work on writing letters inside the wikki stix to build spatial and size awareness in handwriting. Use the wikki sticks to do this activity on paper or a chalkboard. Other ideas might be using crayons, markers, or a grease pencil for more feedback through resistance and proprioceptive input to the hands.